With iMovie for iOS version 2.2.3, users can populate new projects with multiple photos and videos by batch selecting content directly from the "New Project" menu. Instead of adding them one by one, iMovie now inserts selected media into a project timeline automatically. In addition to project creation modifications, the latest iMovie version incorporates iOS share sheets integration for Facebook and Vimeo. For students lucky enough to have access to Apple products at school, iMovie now supports Shared iPads, a multi-user device feature rolled into iOS 9.3. Finally, Apple includes the usual unspecified stability and performance improvements seen with most iterative software releases. 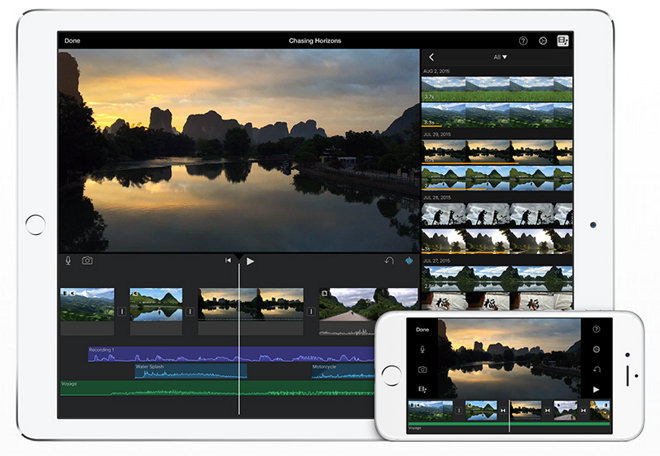 Apple's iMovie for iOS was last updated in October, when the app gained support for 4K video editing on iPad Air 2. That release followed a major update issued a a month prior that introduced support for 4K video, 1080p content filmed at 60 frames per second, 3D Touch and more. iMovie for iOS version 2.2.3 is a free download for existing customers, while new users can purchase the app for $4.99 from the iOS App Store.